"Carol Tenopir and Donald King offer an astute presentation and analysis of what is known about production, transfer, and use of knowledge by engineers. Their book offers the most current thinking about the communication patterns of engineers. . . . It should broaden the view of students; serve as a valuable resource for scholars and researchers; and help practitioners shape policy, manage knowledge, and provide information services." 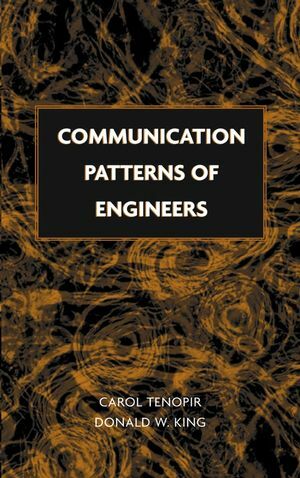 "This book presents, reviews, and analyzes data from research studies covering a broad array of relevant aspects of engineering communication, and creates a good picture of the complexities of engineering as a field. Engineering educators and librarians will find useful direction and support in this book as they plan and collaborate on engineering education programs and library services for engineers. " CAROL TENOPIR, PhD, is a Professor in the School of Information Sciences at the University of Tennessee, Knoxville. In addition to four books, Dr. Tenopir has published over 200 journal articles. Since 1983 she has been writing the "Online Databases" column for Library Journal. Dr. Tenopir is a frequent speaker at professional conferences and has earned numerous teaching and research awards. DONALD W. KING, a statistician, has researched science, engineering, and medical communication for over forty years. He has authored or edited sixteen books, two of them award winners, and in the late 1970s he was named as one of the ten most-cited authors in the information field. Among numerous awards, he was named Pioneer in Science Information (Chemical Heritage Foundation). The Engineering Profession and Communication. Engineering Education and Communication Skills. The Engineering Scholarly Journal Channel. Engineering Communication Patterns Compared with Science and Medicine. The NASA/DOD Aerospace Knowledge Diffusion Research Project.